Russell Lodge A.F. & A.M. « Mystic Valley Lodge A.F. & A.M.
Russell Lodge A.F. & A.M. In the year 1922, when Masonry in the Town of Arlington was growing rapidly in numbers, it became obvious that the organization of a second Lodge within the town was highly desirable. On September 7th of that year, action in Hiram Lodge was initiated to establish the new Lodge. It was voted that a Committee of seven members of Hiram be appointed to p©etition the Most Worshipful Grand Lodge of Massachusetts for dispensation for holding a new Lodge within the jurisdiction of Hiram Lodge. This Committee, with Wor. Frederic W. Damon, Chairman, presented to Most Worshipful Dudley H. Ferrell a petition signed by 112 Masons asking that a new Lodge be instituted in Arlington , to be named Russell Lodge, and that Wor. Edward T. Erickson, a Past Master of Hiram Lodge, be appointed as the first Worshipful Master. The petition was granted and, of the 112 signers, 108 become charter members. On June 13, 1923, Russell Lodge was instituted in the Masonic Apartments at the corner of Massachusetts Avenue and Medford Street in Arlington, with R.W. Fred L. Moses, District Deputy Grand Master of the 6th District, presiding. Wor. Bro. Erickson was installed as Master; Wor. Roger P. Eaton, a Past Master of Mount Horeb Lodge, Woburn, was installed Senior Warden and Bro. Edward L. Shinn, Junior Warden. Ten of the Charter members became Worshipful Masters of the Lodge. Our Lodge was named after R.W. James Russell, a relative of Jason Russell, a name proudly associated with the early civic and Masonic history of Arlington. R.W. Bro. Russell was Master of Hiram Lodge in 1818-20 and 1829-43. In 1821-22 he was District Deputy Grand Master of the then 9th Masonic District, which included Lodges from Charlestown to Reading, and Needham to Waltham! A stalwart leader, and worthy to have his name perpetuated in an Arlington Lodge. The first meeting of Russell Lodge, U.D, was held on September 12, 1923, and 7 candidates were elected to receive the degrees, Brother Arthur William Crampton being the first candidate so honored. On March 20, 1924, the Masonic Apartments in Arlington were destroyed by fire, and our April meeting was omitted. Such a disaster so early in the life of a Lodge imposes an extremely heavy burden. That Russell Lodge successfully recovered from this great trouble is due to the skillful handling of Lodge affairs by Wor. Bro. Erickson and his officers. The May, 1924 meeting was held in the Masonic Apartments of Sagamore Lodge in West Medford; thereafter meetings were held in the Cambridge Masonic Temple until the new Arlington Temple was built and ready for occupancy in September, 1925. Russell Lodge was constituted on May 2, 1924 by Most Worshipful Dudley H. Ferrell, Grand Master, in the Masonic Temple in Boston. The ceremony was preceded by a dinner attended by 310 members and guests, including the Grand Lodge officers. At this meeting the first Officers’ regalia of our Lodge was presented by the other Lodges of the District, the presentation being made by the Master of King Solomon’s Lodge. At that time, the membership was 117. Our Lodge weathered the depression years of the thirties successfully, and continued to grow in membership, and on May 9, 1934, during the term of Wor. Wernest R. Moore, we celebrated our tenth anniversary. The original officers of the Lodge were present at that meeting, and took their respective stations during the evening. Fifty-four Charter members also were present and responded to the roll-call. The Lodge membership was 232. The years following our “Tenth” saw Russell Lodge gain in numbers and prestige. Many prominent townsmen: businessmen, educators, clergy, became members through the degrees, or by affiliation. Immediately following Word War II, Masonry’s high ideals attracted large numbers of applications. In 1946-47, fifty-six candidates were raised, and Wor. Harold E. Meyer and his officers missed many dinners at home. As time marched on, Russell Lodge continued to prosper, and to labor in the ways of Masonic tradition. We recall with pleasure our many delightful Ladies Nights which expanded our social associations. And those Christmas parties for our children which we hosted with Hiram Lodge. Our membership grew to a peak of 500 in 1960-62 despite losses for various reasons. In 1963, Russell Lodge sent a delegation of Officers to join with other Lodges in the Sixth District to represent Masonry in the parade in Lexington to celebrate the 250th Anniversary of that Town. This was a rare occasion, for public appearances of our Craft, once so prominent in civic activities, are now seldom observed. On June 15, 1963, under special dispensation from the Most Worshipful Grand Masters of Massachusetts and Maine, a Special Communication of Russell Lodge was held at Nollesemic Lodge, No 205 in Millinocket, Maine. This occasion was a Fraternal Visitation by R.W. Richard P. Nyquist, D.D.G.M. of the Somerville Sixth District, attended by a group of 27 members of Russell Lodge, with other notable Masons to grace the festivities. Wor. 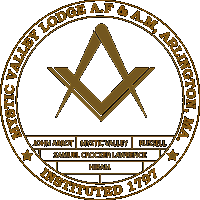 Loring E. Trott and the Officers of Russell Lodge exemplified the Massachusetts Master Mason degree as the work of the evening for the edification of our Maine brethren, employing our District Deputy Grand Master and his Marshal and Secretary to fill the gates. Wor. Bro. Trott’s father, Wor. Walter E. Trott, was a Past Master of Nollesemic Lodge at that time. Travel to and from the wilds of Maine was by chartered bus, and was not without incident. En route it was discovered that the cost of transportation had somehow increased; no one was exempted. Much hilarity erupted over something to do with a certain cigarette lighter. At Twin Lakes, Maine, during a stop for reset and refreshment, some sought relief from the oppressive heat of the noonday sun by impromptu aquatics in the cool waters. Our hosts provided Masonic refreshment, and much fraternal enjoyment. Visits were made to the Great Northern paper mill, and an alleged “moose hunt” was included in this rigorous safari. Some of the Arlington craftsmen engaged in aeronautical pursuits at the local airport; others, before low-twelve, were welcomed by brethren of another fraternal order at their club, and entertained most pleasingly. This was one of Russell Lodge’s most notable Communications, and all are agree that the bonds of fraternal companionship where enhanced by it. Locally, some of our activities have included an ecumenical endeavor, together with Hiram Lodge, with Arlington Council, Knights of Columbus. A dinner meeting was held on April 26, 1968 in the Town Hall. This was a stag affair and was well attended. On May 3, 1969 a similar affair was held in the K. of C. Hall, which included the ladies. Arlington Lodges can look forward to more of these social events. At this point in our history, it seems proper to review and record some of the outstanding phases of our Lodge: some pertinent activities and accomplishments of our members. It is not possible to include mention of every individual who contributed to the welfare and success of Russell Lodge but pleasant memories will be recalled as we enumerate some of the relationships the passage of time has brought about. In the 50 years of our Lodge, 965 Masons have become members, either through the degrees or by affiliation. We honor these brethren tonight. Those who have entered into the Celestial Lodge above leave fond remembrances of their Masonic associations with us. Some 200 of our members live at distances too far to afford frequent attendance with us; to these we give the travelers salutation: “Wish you were here.” At this writing, our membership stands at 416. The virtues and accomplishments of the Past Masters of our Lodge have escaped the notice of the 13th L. of I. ever since! Wor. Albert H. Morris, our first Senior Deacon, was raised in John Abbot Lodge in 1914, and affiliated with Russell Lodge as a Charter Member. He was Worshipful Master in 1927-29, became Secretary in 1930 and served in that capacity for 19 years. His genial personality and untiring service to Masonry and to Russell Lodge endeared him to every member of the Craft. He served Grand Lodge as Junior Grand Steward in 1935, and was elected an Honorary Member of Russell Lodge in 1954. In January 1964, while Brother Al was confined in a hospital with what proved to be a terminal illness, the D.D.G.M. of the Sixth District, R.W. Robert W. Custance, accompanied by a group of our members, visited him and presented him with his 50 year Veteran’s Medal. Wor. Arthur W. Sampson, a Charter Member, was Worshipful Master in 1936-38. He is also an Honorary Member. He was honored in Grand Lodge in 1945 by appointment as Grand Standard Bearer, a position often filled by former Governor of Massachusetts, R.W. Leverett Saltonstall, and in 1944 he was awarded the Joseph Warren Medal for outstanding service to Masonry in World War II. He held a position as Trustee in our Lodge for 26 years, and also served as Treasurer for 12 years. His frequent attendance at Lodge meetings is an inspiration to all, for Wor. Bro. Arthur is a senior member at 85. Wor. Roger P. Eaton, our second Master, was raised in Mount Horeb Lodge, Woburn, in 1911. He was Master of that Lodge in 1920, and thus has attained the rare distinction of being a 50-year Past Master. He was also an Honorary Member, and received his Veteran’s Medal in 1961. He celebrated his 61st Masonic Anniversary last November, and observed his 85th birthday last week – May 12, 1973. Wor. Henry E. Castellon, our Secretary since 1962, was raised in Samuel Crocker Lawrence Lodge in 1926. He affiliated with Russell Lodge in 1945. For 11 years it was his usual custom at Lodge meetings to enter the electrician’s sanctum and there offer up his talents at the control of the lighting system. As our Secretary, he has earned the admiration of the Lodge by his meticulous attention to the records and to Lodge business. He affiliated with Soley Lodge and became its Master in 1969. He is President of the Arlington Masonic Temple Association, serving that office since 1963. There are, of course, many Brethren of our Lodge who have contributed significantly to its success, and its standing in the Arlington Masonic community. We salute all those who carried the burdens in the early days: the unfamiliar functions of a new Lodge; the financing of a new Temple; maintaining the Lodge morale when interest waned and candidates were few. And those who responded to calls of Masters to serve the Lodge on committees and blood programs – history does not record the names of all, but recognizes the worthiness of their deeds. It may be said that the past is prelude to the future, and that history is a portrayal to which may be added the things to come. If such be the case, our Lodge faces the years ahead confident that our Masonic future is secure; that the foundation is firmly established and the superstructure is sound. We are fortunate in our close fraternal associations in our town; and with our brother Lodges – Hiram and Freedom – we head bravely along the path prepared for us fifty years ago. We are proud of the fact that our temple is the home of those of kindred minds: Menotomy Royal Arch Chapter; the 13th Lodge of Instruction; Eastern Star; Rainbow Girls; DeMolay Boys; the Daughters of the Nile. It is a beehive of Masonic activity. Our nation will celebrate its bicentennial in 1976. In those two hundred years the United States of America has grown in wealth and power – a leader among the nations of the world. Masonry has played a tremendous part in this segment of world history. Brother George Washington, while leading the nation’s armies, relied on Masons for positions of trust, and as first president, was widely acclaimed for his Masonic posture. Many of the nation’s prominent citizens have been Masons, and the records are replete with their accomplishments. But now there are times of turmoil and dissent in our fair land. Foreign and domestic quarrels rule the news and adversely affect our lives. Moral decay and the appalling disregard for human values are apparent everywhere in the world. It is now, more than ever before, that the Landmarks of Masonry, and the tenets of our profession stand forth clearly as a guide for the conduct of all men. Let us resolve together that our high ideals will not yield to satanic powers of destruction. Thus we come to the closing days of our first fifty years. May tomorrow be a propitious beginning of our second half-century. Russell Lodge is included in the Masonic Geneaology.